“This is now my thirtieth year in radio. I started at a college radio station out in Santa Barbara. I was absolutely atrocious at it,” Hannity admitted with a laugh. “I got moved to talk radio. I used to be a caller to talk radio. I grew up in New York, I heard the best hosts, the great pioneers in the industry – people like Barry Farber, Barry Grey, Bob Grant. Later on, Rush came on the scene,” he recalled. “I actually started, I think it was 1987, so I think this is my thirtieth year; I’m pretty sure. I’m about to start my twenty-third year at Fox. If I told you it went by in the flash of an eye, it’s just true. It really goes by very fast. It’s just an amazing thing,” Hannity remarked. “When I got behind a microphone and a light goes on, all of this stuff just comes flying out of me. Half the time I don’t even know where it came from. I just have a love and a passion for the country, for politics, for issues, for debate, for an open exchange of ideas, ideals, and opinions,” he said. “In many ways, I found what I love to do. I never thought I’d make a good living at it because I started as a volunteer. My first professional job was in Huntsville, Alabama. I didn’t know a single person in the state. I packed a van and drove across the country. I think I was paid $19,000 a year. Every time I got an opportunity, I would just get on the high board, look down, be afraid, and just jump and take my chance,” he said. Hannity said the Richard Jewell incident taught him a valuable lesson in taking his time to get the details of a news story right. “I can give you a number of examples where I just stood back and looked at it a little bit differently and waited for facts to come in. Trayvon Martin – George Zimmerman was one case. Nobody expected the eyewitness to say that there was a ground-and-pound of George Zimmerman’s head on cement, which led to the verdict we got in that case. Everybody in the media seemed to be one way, and I was willing to stand out on my own,” he said. “The same thing in Ferguson, Missouri; it turns out ‘hands up; don’t shoot’ never happened, and Darren Wilson was exonerated and not indicted because of predominantly African Americans that told the truth, that Michael Brown had reached into the car and was charging at the officer,” Hannity continued. “That was not the narrative in the media. The same thing happened with Freddie Gray in Baltimore, the Duke lacrosse case, and, politically speaking, I would argue that I was vetting Obama a lot more than other people were, with Bernardine Dohrn, Bill Ayers, ACORN, Alinsky, Reverend Wright. We were way ahead of the curve on those things,” he said. “I can say Breitbart was in the same spot, too, that I really believe Donald Trump had a very good chance to be the president, and nobody really saw it coming,” he added. “So one of the things we do pride ourselves on the show, in radio and TV, is I try to be objective. I don’t watch other coverage. I don’t listen to other shows. I just try to look at facts, and then I do my own work behind the scenes. I’m not always right, but I’ve been right a lot more than I’ve been wrong. I think that’s been a very good model for me because of practice,” said Hannity. “You know, when Barack Obama was president and he rushed to judgment without any facts with the Cambridge police or in the Trayvon Martin case or in Ferguson or in Baltimore, I thought he did the country a disservice and a great injustice in that case, especially with the power of that pulpit,” he charged. “We point out, number one, the things that he’s doing, the promises that he keeps. We also try and hold him accountable if we think he’s getting off course. For me, it’s all about the agenda. For me, it’s about the American people. For me, it’s about getting people back to work, out of poverty, off of food stamps, back in the labor force, having a thriving economy, having safety and security in our country,” he declared. “Something you and I have discussed at length is, I know that you are the editor-in-chief of Breitbart London, and we’ve talked at length about the security issues not only in London, but in Paris and Brussels, Belgium, and all throughout western Europe now as a result of the migration issues that have impacted some of the safety and security issues of Europe,” Hannity told Kassam. Kassam asked Hannity for his take on immigration reform and the possibility that President Trump would make a deal with Democratic leaders in Congress to provide amnesty for the illegal aliens formerly covered by President Obama’s DACA order. “He also has to deal with the Democratic Party. None of them have ever liked him. They haven’t lifted a finger to support him in what, we’re now in the ninth month of his presidency,” Hannity observed. “Then you’ve got a media that wakes up every day thinking, ‘How can we destroy this president?’ I call them the Destroy Trump Media,” he continued. “And then you’ve got weak Republicans and NeverTrumpers. Those are people that never wanted him to be president. Now, Breitbart is run by Steve Bannon now. Steve made a comment on 60 Minutes that I agree with. I could say that the leadership in the House and the Senate have not wanted this president to succeed. There is great antipathy towards him, and we are a party right now that doesn’t have an identity,” he lamented. 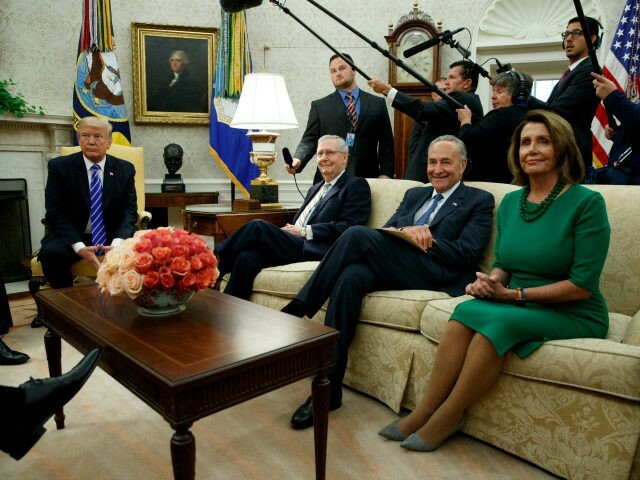 “I would argue by them failing to keep a seven-and-a-half-year promise of repealing and replacing Obamacare and failing to be prepared to deal with the debt ceiling, they’re literally pushing the president – who I believe in my heart wants to keep all of his promises – into the arms of the likes of Schumer and Pelosi, to see if there’s an opening there to work with them because they’re not doing their job,” Hannity charged. “The ideal situation would be the Republicans get their act together and keep their promises that they made to the American people, but I’m not holding my breath on that,” he said sarcastically.